We had been hearing for a while that Honda SIEL Cars India was going to launch a new version of the popular upper C-segment sedan Honda City. And it has happened today. Let’s take a look at what Honda has on offer now. There are two new variants. The Inspire and the Elegance. Both are basically about different trim levels and aesthetic appeal that is better than the current so called ‘all-new’ Honda City. The current versions of the Honda City are priced at Rs 8.37 lakh for the basic 1.5S MT at New Delhi (ex-showroom). That would be close to Rs 9.5 lakhs as the price for the City on-road. Not cheap, by any means. If you thought that was expensive, the new City versions will leave you quaking in your boots. So far, the costliest Honda City – the 1.5V AT – in India was priced at Rs 9.54 lakh on-road – an on-road price of close to Rs 10.5 lakhs. For now, you can take a quick look at the new variants and their prices below. The new variants would come with five spoke alloy wheels, front fog lamps, chrome door handles, better (sporty, Honda calls it) exhaust finish, and front and rear mud-guards. As you know, MT denotes manual transmission and AT stands for automatic transmission. The Inspire versions of the new City have better trim levels inside than the Elegance versions. Both however would be better than the current Honda city in the interior trim level department. There is no engine change or variations – all models would be powered by the 1500 cc four cylinder unit that produces 118 bhp. Introduction of the new Honda City had hit sales of the Honda Civic hard – with many opting for the new City instead of the older Civic. To beat this and attract buyers back to the Civic, Honda recently launched a new version of the Honda Civic with some minor cosmetic changes. Even if you are psyched by all the new costly additions, things are not too bad for those with thinner pockets. 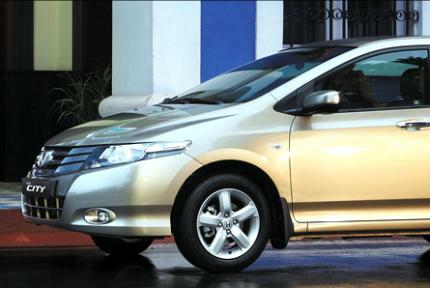 The beige colour scheme will be available in the current Honda City models too. Not bad, thank you Honda! There is a new colour too on offer for the festive season – Deep Sapphire Blue.